Intermodal and logistics service provider Hub Group reported revenue topping $1 billion and higher profits in the fourth quarter of 2018. The Oak Brook, Ill.-based company said net income was $48.9 million, or $1.46 a share, in the three months ended Dec. 31, compared with net income of $99.9 million, or $2.99 a share, in the same period a year ago. Results in 2017 included a one-time benefit of $75.2 million, or $2.25 a share, as a result of the Tax Cuts and Jobs Act. Excluding the impact of tax reform, Hub Group said net income was $24.7 million, or 74 cents a share, in the fourth quarter of 2017. Breaking down results by division, intermodal revenue increased 18% to $598.1 million in the fourth quarter of 2018 from $508.3 million in 2017. Truck brokerage revenue fell 12% to $140.3 million in the fourth quarter from $158.5 million in 2017. The unit handled 3% fewer loads, and gross margins shrank as a greater percentage of loads were handled under fixed price contracts rather than in the more volatile spot market. Logistics revenue increased 8% to $200 million in the fourth quarter due to the acquisition of CaseStack Inc. in December and additional business with existing customers, the company reported. Dedicated contract carriage revenue rose 40% to $80 million in the fourth quarter from $57.1 million in 2017, and the business ended the period with a fleet of 1,400 trucks and 5,200 trailers. 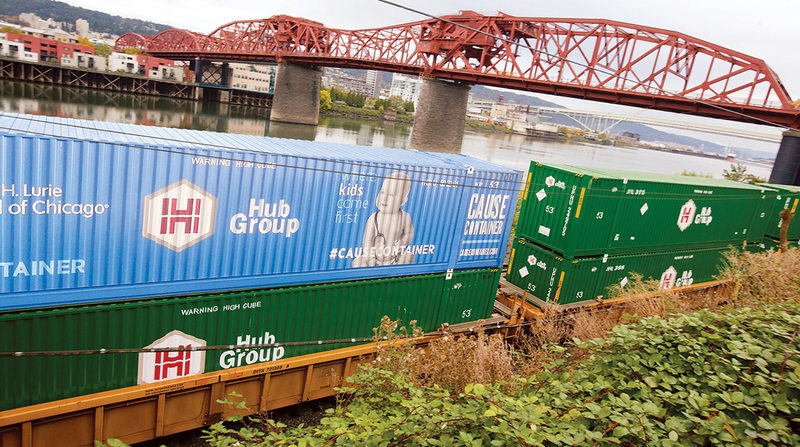 Hub Group’s results include income from discontinued operations of $15.2 million, or 45 cents a share, in the fourth quarter, compared with net income of $3.9 million, or 12 cents a share, in 2017 related to the sale of the company’s multimodal freight brokerage subsidiary, Mode Transportation, in September. Hub Group ranks No. 33 on the Transport Topics Top 50 list of largest logistics companies in North America and No. 11 on the TT list of largest dedicated contract carriers. The company also ranks No. 8 on the Transport Topics Top 100 list of largest for-hire carriers and No. 2 on the list of top for-hire carriers in the intermodal/drayage sector.